For years, John Brice and his family have cruised the waters of British Columbia in a variety of powerboats, enjoying every moment afloat in one of the world&apos;s premier cruising areas. But every now and then, they thought boating could be better. It would be nice, John and his kids believed, if they could barbecue in the cockpit without getting soaked by summer showers that sweep along the Inside Passage. Something else they came to crave was space for the moments of privacy everyone needs occasionally. And what about a generous saloon with a dining table and a lounging area? And, they thought, we&apos;d like a galley that functions well but doesn&apos;t divorce the cook from guests. It would be good, also, to be able to service pumps and valves without crawling deep into the bilge or into compartments not designed for human occupancy. The wiring should not be a mystery and the total yacht package should remain simple, the Brices concluded. "We&apos;ve had boats for 25 years," Brice says. "We started at 28 feet and moved on up to 44. But it was always a compromise, and we were always saying we wished we had this or that." Five years ago, they began talking about a boat that would work best for them, and perhaps for others. They traded ideas and dreamed about spaces. About three years ago, the conversation turned serious, and John and his son Trevor, a university student, began drawing lines to scale and thinking about where things should go, how big certain spaces needed to be, and where to find storage. Once, they chalked the lines of the boat they had in mind (actual size) on the asphalt of a parking lot. "It was in the space behind our office," Brice recalls. "We had put the lines on paper, but I wondered if we would be able to move around. So, I said let&apos;s draw it out, mark in a sofa, put in a chair, to see how it feels." It felt right. "Everything was practical, easy and simple," he thought after walking between the chalk lines. "It was not too complicated." The next step was to see a naval architect, who used computer programs to determine the center of gravity and to check the accuracy of Brice&apos;s calculations. As a result, the floor level was changed and the keel was made heavier. For years, John Brice has visited China every couple of months to buy merchandise to import to Canada and the United States for resale in major discount stores. It&apos;s a highly competitive business, but Brice has succeeded by keeping costs, especially his overhead, low. It&apos;s a trait he wants to introduce to building and marketing yachts. It was natural that he&apos;d use his China connections to link up with a boatbuilder that had years of experience in yacht production in Asia. He invested in and formed a joint venture with Ningbo FuHai FRP Boat Manufacturing Company near Shanghai, itself a joint venture between Ningbo Safe Boat Building Company and the Oriental China Investment Company, owned by Ernest Lee, a founder of Taiwan-based CHB. The principals have been building boats in Taiwan and China for 30 years. 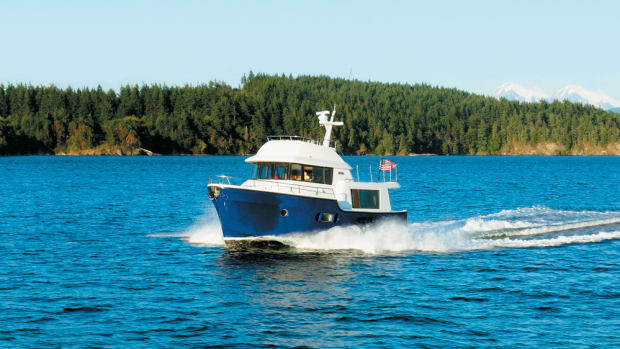 The boat they launched a year ago is a raisedpilothouse trawler called North Pacific 42. 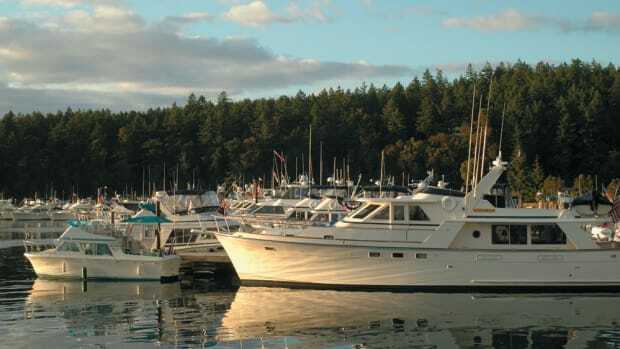 Calling on his business experiences, Brice is marketing the yacht from his import offices in Surrey, British Columbia, at what he calls "an unbeatable factory-direct price." Trevor gave up plans to become a commercial pilot to take charge of sales and promotion. Because of his low overhead and the reduced cost of building in China, where boatbuilders earn a fraction of what counterparts are paid in Taiwan and the United States, Brice is delivering what he considers a good deal: A 42-footer fully equipped, except for electronics and dinghy, for $299,000. The bonus in going to look at the North Pacific 42 was that the boat was moored on Granville Island, in the heart of Vancouver, British Columbia. It is, inarguably, one of the most beautiful cities and a delight to visit. All white gelcoat and stainless steel on the exterior, the 42 glistened in Canadian sunshine as Trevor Brice led us from the island&apos;s market area and down a ramp into the moorage. The hull is solid, handlaid fiberglass. The deckhouse is foam cored. Everything is done by hand, without vacuum bagging or infusion processes. It&apos;s a pleasant shock, stepping from the contemporary glass-andstainless exterior into the saloon, which is yacht traditional, with softly finished teak woods and veneer. The Chinese builders are skilled craftsmen: All teak joints are tight and true, and the finish is clear and free of glitches. A few panels have exposed screwheads so that they may be removed to reveal cable raceways, but the screws are unobtrusive and perfectly flush. Inside, it&apos;s obvious the Brices got the space they wanted. A table and seats are to port, and an L-shaped settee is to starboard. The saloon is 11 feet wide and more than 11 feet long. The galley is forward and to port. Although it&apos;s U-shaped, there is space in the galley for a cook and a helper. There are no cabinets hanging from the overhead, giving galley workers unlimited visibility and protecting them from head bumps. The cabinet arrangement is another compromise. If dishes can&apos;t be stored overhead, they must go on shelves beneath the countertop, and that means there&apos;s less space for other galley storage. However, the NP42 has generous storage throughout the boat, under seats and steps, for cans and cartons and other galley stuff. FuHai will do some custom work at no added cost. The saloon settee can be replaced with casual chairs, for example. We found space for a microwave and even a dishwasher, and Trevor thought both were possible changes. The sole is finished with teak and holly throughout the boat. Centerline steps lead from the saloon to the head and two staterooms below. To port is the guest room, for which buyers may choose a twin bed, stacked bunks or an office arrangement. The head, with a separate enclosed shower, is to starboard. A walkaround double berth with storage beneath is forward. There&apos;s a hanging locker to starboard. A good choice would be to substitute another locker for the vanity on the port side. Lifting hatch covers in the forward companionway sole reveals pumps, plumbing and other gear often scattered about the bilge. The demo 42 has a pair of Cummins C series engines, each rated at 220hp. However, the Brices now market a single-engine boat as the fleet standard with the 370hp Cummins recommended. Smaller engines are available, as are some Yanmar models. 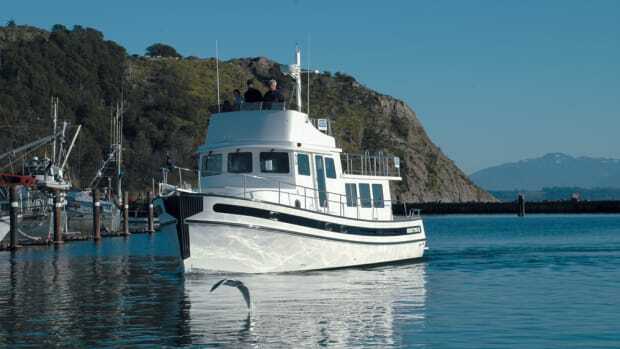 With a single engine and a bow thruster, the boat costs less. Having only one engine costs less to operate and is quieter. The twin version will do more than 14 knots and cruises easily at 10. With a single, expect to cruise at 9 or 10 and to see a top speed of about 13. At 8 knots, the single will burn about 5gph, the builders estimate. Ten knots will cost you about 8gph, they say. To satisfy his demand for simplicity, John specified mechanically controlled Cummins engines. He also ordered Morse mechanical transmission and throttle controls for helm stations. Six hatches in the saloon open to the engine room. Only two need be opened for oil checks and routine maintenance. Opening others puts all equipment and systems within easy reach. The hatches are wood, with a teak-and-holly surface, and they&apos;re heavy. They are not hinged, so owners must remember to lay them flat on the sole before going below. The temptation is to simply lean them against something, but even a small swell could tip them over. Even with twin engines, there&apos;s good space belowdecks for routine work and for related equipment-a furnace, an inverter, extra batteries and a generator, for example. Wiring and electrical panels are on the forward bulkhead. There are battery-disconnect switches in the engine room and, importantly, in the pilothouse. Wiring and plumbing runs are identified, although the paper tag attached to a water-heater hose may not survive. A single Racor fuel filter serves each engine. As the boat is delivered, she has a light AC load. Expecting that buyers eventually will add 120VAC systems (for coffeemakers, microwave ovens, toasters, hair dryers, TV/VCR, for example), the NP42 is equipped with a 2,500-watt inverter. There are AC outlets throughout the demo boat, and Trevor Brice promised more on subsequent yachts. The NP42 single-engine boat carries 500 gallons of fuel in two tanks and 400 of water in three tanks. All tanks are stainless steel. With a wide choice of single engines, and with the performance of a lone 370 nearly matching that of a pair of 220s, it&apos;s likely few twin-engine boats will be built. The Brices say the NP42 comes equipped for use, except for electronics and a dinghy. Let&apos;s look at what "well equipped" means. Although the dinghy is an extra-cost, postpurchase item, the 1,100-pound-capacity, low-profile davit comes with the basic package. Also on the standard equipment list are a generator (a 5kW Northern Lights or a 7.5kW Westerbeke); a bow thruster; a diesel-fired, forced-air furnace (or reverse-cycle heating/cooling); trim tabs; a VacuFlush toilet; a windlass; a 45-pound anchor and 300 feet of chain; a seawater washdown at the bow; marble or Corian countertops; a hinged radar arch; and screens on opening windows. The selection of electronics is subjective and personal, and the Brices believe it&apos;s best left to boat owners. At one time, commissioning a new boat was a lengthy process in which most of that equipment was acquired and installed at the owner&apos;s cost after delivery. Commissioning often delayed the owner&apos;s first cruise for weeks or months and increased costs significantly. Now, however, there&apos;s a growing trend toward delivering a turnkey yacht, one almost ready for sea on delivery. Other builders also are including ground tackle, heating and/or cooling equipment, washdown systems, generators and other gear in the basic boat package. North Pacific is meeting that competition and taking it one step further by agreeing to install owner-supplied electronics at no extra cost. John Brice recommends buyers make the trip three or four weeks before completion. All gear and systems are complete at that time and are easily viewed because paneling has not been installed. Although the boat structure is Chinese, its components are international in origin and found on many better-known yachts: Vetus, Cummins, Yanmar, Northern Lights, Westerbeke, VacuFlush, American Standard, CQR, Norcold, Princess, Morse, Espar, Hynautic, Racor, Nidacore. 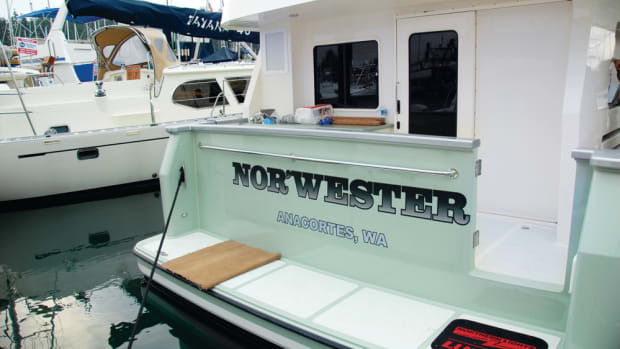 Don and Celia Paxton of Port Orchard, Washington, bought the second North Pacific 42 off the production line. Experienced boaters, they liked the size and layout. "The price got us," he says. "We had been looking for something to live aboard," Don recalls. "We walked aboard and Celia said, &apos;This is the layout we&apos;ve been looking for.&apos;"
The Paxtons asked for an additional hanging locker in the master stateroom and for more drawers. They were included in the basic price. They considered converting the guest stateroom to an office, but did not because they believe the stateroom configuration offers more space and storage. The builder added a chest of drawers and extra shelving within the base price, Don reports. Don planned to install the boat electronics. He&apos;s done that work before on other boats. In the months before the boat was to be delivered, the Paxtons put their house on the market and arranged for storage for items they will keep but that won&apos;t fit on the boat. This will be their first adventure living aboard. "My brother has been doing it [on a 35-foot Nordhavn] and has been having a great time. He encouraged us to do it and showed us that it can be done," Don says. Their cruising goal is Southeast Alaska. Trevor Brice did a masterful job in maneuvering the North Pacific 42 from its crowded moorage into the open harbor. Twin engines simplified the task, but a single with a bow thruster would have done equally well. John and I trailed behind in a 19-foot, outboardpowered runabout, taking pictures of the 42 under way. The NP42 slashed through some large wakes and chop generated by a northwest wind of 10 to 15 knots, but took little spray on her windshield. Farther out, we encountered swells rolling in from the Strait of Georgia. The 42 held steady, even as Trevor turned to catch the seas on the beam. Later, I scrambled aboard and Trevor gave me the wheel. I had been concerned that putting a raised pilothouse atop a stretched hull might have made the boat tender. But the additional 1,600 pounds of ballast in the keel and the attention to engineering details seem to have created a stable yacht. I turned back toward the Strait of Georgia and found that the boat rose and fell with the gentle swells but did not roll significantly. In both easy and moderate turns at 10 knots, she turned as if riding a track. At hard over, there was only the slightest suggestion of heel. The rear pilothouse window in new boats should be welcomed. The demo boat does not have that window, forcing the helmsman to go to the doors for a look astern. The Hynautic hydraulic steering was responsive and prompt. Even better, it made me feel I was really steering a boat, not just spinning a wheel. On the demo model, engine room gauges were directly ahead of the wheel. My bias says they should be overhead or off to the side, because they do not demand constant attention. Navigational gear-radar and plotters, for example-should be in that precious space just ahead of the helm. Trevor said that could be arranged and indicated that they had been considering putting an integrated electronics package at the helm in a yacht that&apos;s being prepared for boat show appearances. Despite this emphasis on electronic navigation, the NP42 has sufficient helm space to display paper charts, and drawers for storage of folded charts. We did not have a decibel meter aboard, but the noise level in the pilothouse did not interfere with normal conversation. In the saloon, above the engine room, diesel noise made chatting difficult when the twin 220s were running at 2000 rpm. A single engine should be quieter, but additional acoustical insulation would be good. The Brices have built the boat they wanted. My boating experience matches John&apos;s-decades cruising the Inside Passage-and it&apos;s apparent he got the formula right. 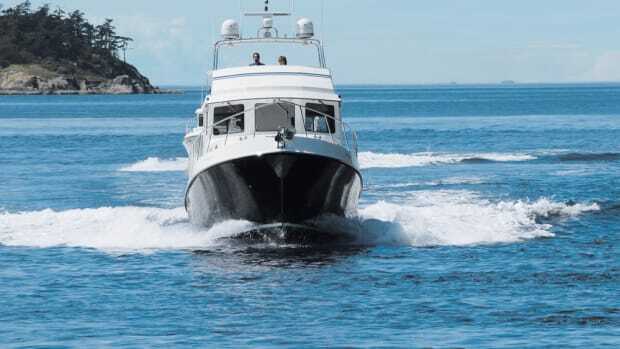 There is cockpit protection, the interior spaces are generous, the pilothouse offers the visibility needed when cruising waters littered with drift logs or ice (and speeds of 8 to 10 knots are right for those cruising conditions), and the styling is traditional, with a little zip. Although John describes the North Pacific 42 as "the perfect West Coast boat," it would be a delight on any coastal passage, anywhere. For Trevor and John, the challenge is to make their factory-direct, low-overhead sales program work. They are excited by the potential and undeterred by competition from other China-built boats. "The reception we&apos;ve had has been absolutely amazing," John says. "We have had a really good reaction from many people."